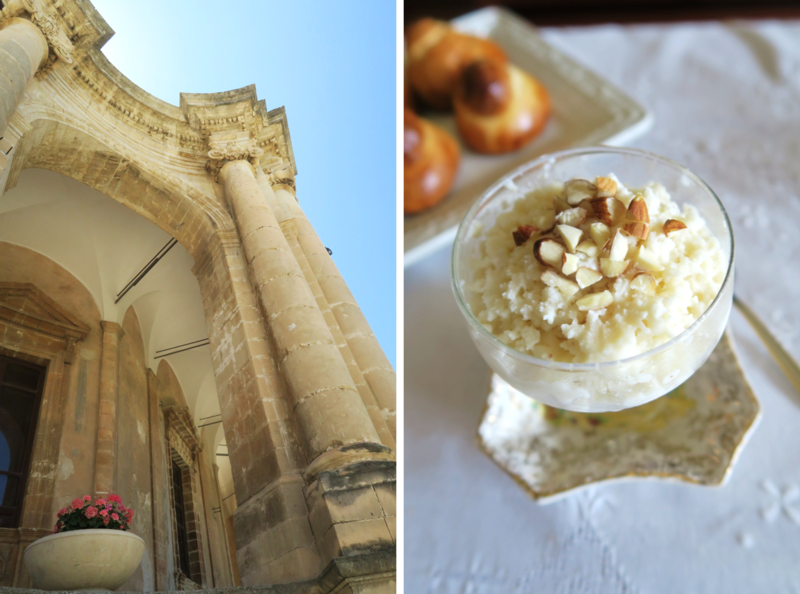 Here is my contribution to our quarterly edition for Cucina Conversations whose theme is ‘travel and food’; so I conclude our journey through Sicily with beautiful Noto and a recipe for a Sicilian inspired breakfast that includes - granita alla mandorla served with brioscia (almond granita and brioche). 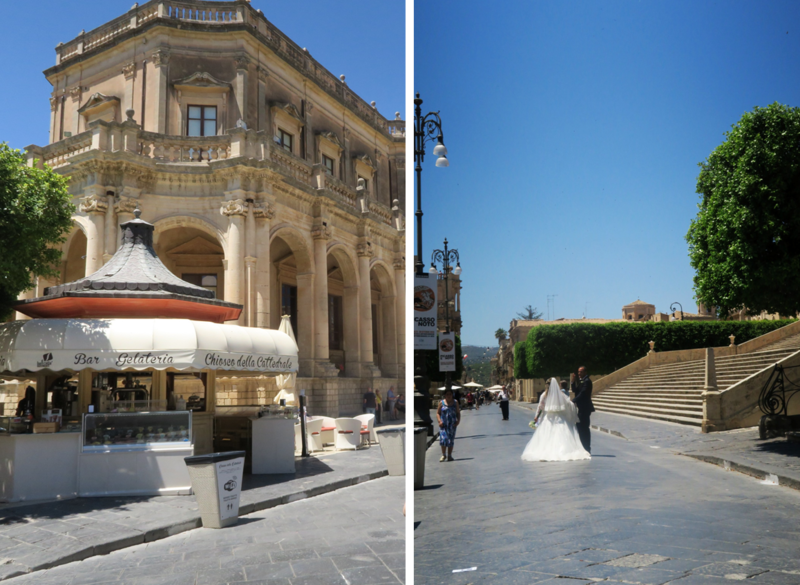 Noto, is a lovely curated Baroque gem of a town just south of Siracusa, where its historic buildings are sun kissed and framed by the blue sky. Everything is magnificent, from the steps of the Cathedral dedicated to St Nicolo` to the balconies of Palazzo Nicolaci Villadorata. This town also has a rich pastry tradition owed mainly to the convents and monasteries that played in the history of Sicilian baking. 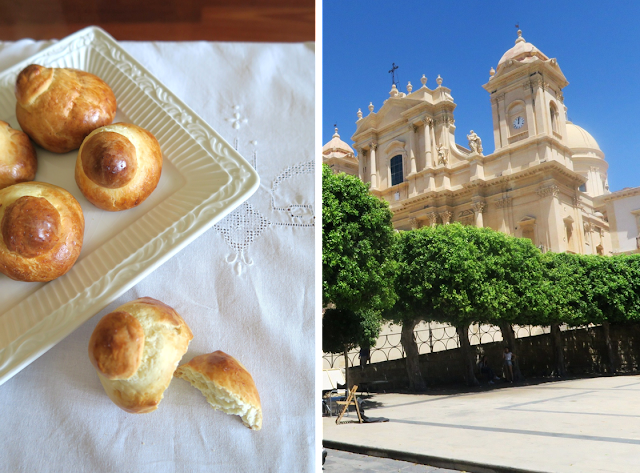 It is documented that at the beginning of the 19th century there were many in the Noto valley alone, and each one was famed for making and selling different dolci (sweets). I previously wrote a post on cassata, which like cannoli is linked to convent bakers. It was only natural then that my focus for this town was going to be savouring its sweets. We only had half a day here as we needed to drive back to Catania airport for our afternoon flight to Naples, so a mid morning (second) breakfast was planned and two iconic places came highly recommended. Dolceria Corrado Costanzo, considered Noto’s best and justifiably the most famous pasticceria is renowned for its torrone (nougat), dolci di mandorla (almond sweets) and cassata to name a few. Sitting around the corner and best known for its granita is Caffe Sicilia serving many favourite combos including coffee, almond and black cherry or grapefruit, mandarin and strawberry. It was here that I decided to have the renowned almond granita served with a buttery brioche bun to cool down from the relentless heat we were experiencing. Noto after all grows some high quality almonds making their granita exceptionally flavoursome and a must try. Almonds have always been an essential ingredient in Sicilian confectionery. Literary texts in all the countries of the Mediterranean refer extensively to these nuts, which have been cultivated since ancient times. The Arabs introduced almonds to the island and were known to process them with honey, milk and fresh or dried fruit. In fact many of the almond sweets from Sicily lay claim to this culture. There are several almond cultivars in the Noto valley, but the most popular is the famous heirloom variety called Pizzuta d'Avola. Pizzuta refers to the physical shape of the almond which is flat and pointy, while the almond takes its name from the town of Avola where they are cultivated. It is the most widely used almond in the local confectionery industry, due to its intense flavour and slightly bitter taste that is ideal for balancing out the sweetness of these sometimes overly sweet dolci (sweets). Through my research I came across and decided to follow the recipe from Sicily On Web, and here I learnt that a true Sicilian granita alla mandorla is made with an almond paste to ensure a creamy texture is achieved. It is strongly recommended that the almond paste is made from scratch rather than resorting to the store bought paste compound which tends to have artificial additives. The recipe calls for the use of full cream milk, but I chose to use almond milk rendering more of an icy texture as a true granita should be. To prepare the almond paste using whole unpeeled dry almonds, they first need to be blanched. Place them in a heat proof bowl and pour enough hot water to cover fully. Allow them to soak for 10 minutes, and then pour out the water so they can cool slightly to safely handle with your fingers in order to peel their skins off. Pat the almonds dry with a kitchen towel and using a food processor, process into a powder. I chose to follow the traditional method, alternatively you can use pre prepared almond meal. Boil 20 g water and gradually add the sugar spoon by spoon stirring continuously until each spoonful of sugar has completely dissolved. While still hot, pour the dissolved sugar into the almond mixture and mix until it comes together as a solid but workable mixture. Remove and lay the dough on a wet surface to cool for 30 minutes. The almond paste is now ready to be used to make the granita. In a saucepan add the 1 litre of almond milk and warm it but do not allow it to boil. Cut the almond paste into small pieces, add them to the warm milk and allow the paste to melt by stirring. Cool the mixture in a tin and place in freezer, stirring through and later smashing apart all the icy crystals into fine pieces with a fork every 30 minutes for 4 hours. This step can also be completed in an ice-cream maker. This granita can then be served on its own or accompanied by a brioche the true Sicilian way. A Sicilian brioche also known in dialect as la brioscia cu tuppu due to its small chignon or tuppo (bun) sitting on top, makes the perfect accompaniment for this granita. Pulling apart pieces of spongy brioche and dipping into a serving of creamy almond granita is a treat! I followed the recipe and steps outlined in this easy to follow Youtube video. I hope you make this Sicilian inspired breakfast, which undoubtedly can be enjoyed any time of the day. Enjoy! To read more recipes for this month’s Cucina Conversations 'Travel & Food edition, visit Rosemarie at Turin Mamma who was inspired by her return trip to Corsica and made crepes called nicci; while Marialuisa at Marmellata di Cipolle made pizzoccheri a type of pasta from the valley in the northern region of Lombardy.